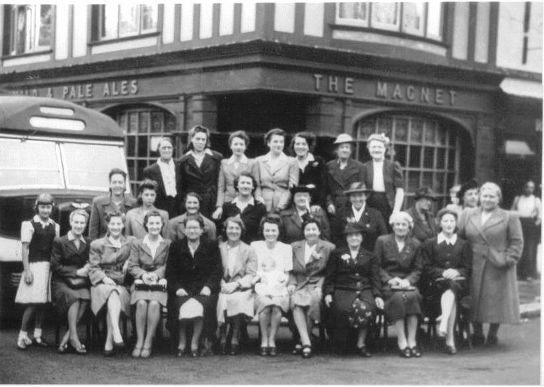 Fay Twydell has provided this photo taken outside the Magnet pub, showing a ladies' group who have either just returned or are about to set off on an outing. They are all wrapped up well, part from the young girl at front left. Fay's aunt has provided some names but Fay notes 'I'm not sure what she means by rows'! Please get in touch if you can help identify where the people are, summary of various contacts about names follows the photo. Fay adds 'my grandmother Maud Wheeler is the small lady in the middle row just below the lady who is second left in the very back row' and 'aunt Pat: 2nd left front row'. At the time the photo was taken the Magnet was managed by Mrs Clark (centre front). John Jennings adds 'the lady in the middle row with her blouse tuck outside her coat is my mother Mrs Jennings. The lady standing infront of the coach middle row is Mrs Kennedy and beside her is her daughter, second from left in the back row is Mrs Cox. hope these names help. I was born at 35 the Ham in 1938, my father was known as Ted Jennings and my sister Lily'. Back: ?, Mrs COX, ?, ?, ?, Mrs BUTLER, ? Middle: Mrs KENNEDY, her daughter, Maud WHEELER, Mrs JENNINGS, ?, ?, ?, ?, ? Front: ?, Fay's Aunt Pat, ?, ?, ?, ?, Mrs CLARK, ?, Clara HAMLIN, ?, ? Please get in touch if you can add any further names.